Orienting your weathervane directionals to true north. First, a little background. When you look at your compass, it is showing Magnetic North, not True North. For the greatest accuracy, you’ll want to set your Northern directional letter to True North. To do this, you’ll need to refer to the Magnetic Declination Map shown below. 1. Find your approximate location on the declination map above. 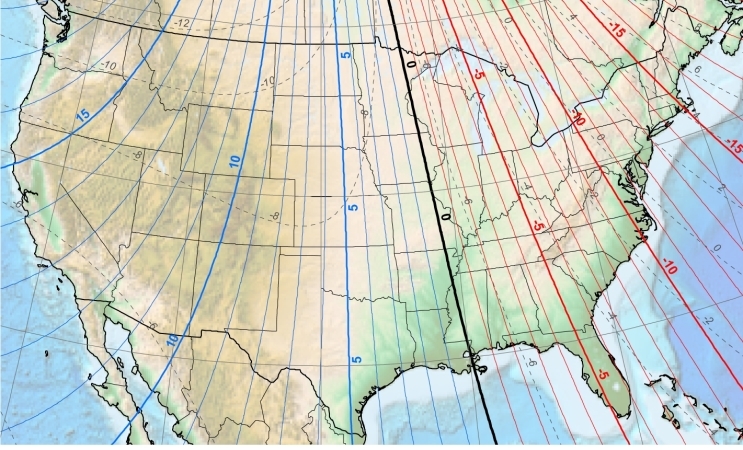 If you live East of the 0 degree line, True North will be east of the compass needle by the number of degrees shown on the map for your location. For example, if you live in Miami, your true north will be 6 degrees east of magnetic north. Set your Northern directional letter 6 degrees east of your compass needle North. If you live West of the 0 degree line, True North will be west of the compass needle by the number of degrees shown on the map for your location. For example, if you live in San Francisco, your true north will be 15 degrees west of magnetic north. Set your Northern directional letter 15 degrees west of your compass needle North.